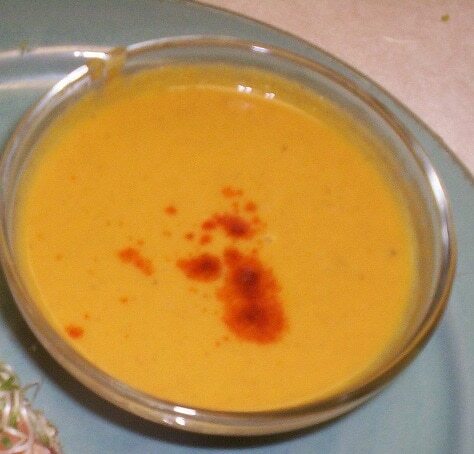 The most delicious carrot soup, you’ve gotta try this! Here’s another fabulous garden recipe that is helping me thrive on my mostly-liquid diet. You will LOVE it, and it’s all raw! Thank you to Patty, who made it for me. I met her at CHI in Michigan a year ago, and brought her out to work for us full-time. I am so thankful, since I was killing myself with overwork, and my kids adore her and think she is the Raw Mary Poppins. It was hard to do, and it’s hard to admit, since I did EVERYTHING myself, from scratch, for 20 years. But because of my work schedule, I needed help. I’m telling you because you’ll see her all over my blog, I’m sure. I’ll share lots of recipes we’re developing. Patty’s a Level III Raw Chef, which means not only is she very accomplished, but also, she can certify Level I and II. We just decided she’ll be teaching certification classes to locals around the first of the year, in my home. Get excited, because this girl can COOK! Or “arrange the elements,” as we like to say in the “raw” world! Scoop the coconut meat and add it to the blender. Juice lemon and tangerine in a citrus juicer and add to blender. I was wondering about the coconut nectar as well. Debbie- I believe the dehydrating is just to warm the soup. Take out your trays (for an Excaliber) and put the soup, in a glass bowl or container, inside the dehydrator. This looks YUMMY! I met Patty during my stay at CHI!!! That is so awesome she’s working with you now. She is great! For the ladies up above, Coconut Nectar is a liquid sweetener that is very low on the glycemic index – lower than agave. It’s great and mild just like agave.